I LOVED THIS BOOK. Yes, I think that I needed to use all caps to adequately express my love for Unbroken. Where do I even begin with this book? I don't want to spend too much time talking about the plot because it's so much better if you experience everything for yourself. While the book summary does give you a rough idea of what happens, any more information might spoil things. I had very little idea what to expect when I started this, and I am so glad I didn't know more. 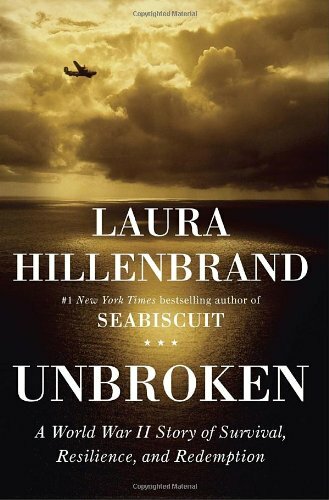 I cannot say enough good things about Unbroken. The story? Incredible. I could not put it down. I devoured this almost 500-page book in almost three days. Three work days. I was pulling this book out every time I had a few extra minutes. It read like an action movie, but it was more compelling in the fact that it was true. The writing was phenomenal. Laura Hillenbrand knows how to make history come alive. I haven't read her first book, Seabiscuit, but I'll be diving into it soon. She is a wonderful storyteller, which is something I really appreciate when I'm reading a biography. I hate when a biography reads like a textbook. I couldn't finish Cleopatra last month for that very reason. Unbroken is the farthest thing from dry or boring. The time period literally comes alive on the page through Hillenbrand's words. Hillenbrand's research was inspiring. I was so impressed with her attention to detail. This book was grounded by its thorough research into the time period. I love books about WWII, but I learned far more from this book than almost any other I've read about the time. From the background on the Army Air Forces to the research into the way Japanese culture played into their behavior in POW camps, Hillenbrand makes sure to back everything up with thorough and thoughtful research. The characters. Louis Zamperini was an inspiring subject. I absolutely loved how the beginning of the book focused on what Louis was like growing up and then on his passion for running. His actions after the plane crash and beyond made for a fabulous read. If you can't tell from all my gushing, I absolutely loved this book. I have since told several people that they MUST READ it, and I will tell you the same. Even if you don't love it, you'll be a better person for having read it. What are you waiting for? Go pick up this book! "Dignity is as essential to human life as water, food, and oxygen. The stubborn retention of it, even in the face of extreme physical hardship, can hold a man's soul in his body long past the point at which they body should have surrendered it. The loss of it can carry a man off as surely as thirst, hunger, exposure, and asphyxiation, and with greater cruelty. In places like Kwajalein, degradation could be as lethal as a bullet."